Smith, James K.A. You Are What You Love: The Spiritual Power of Habit. Grand Rapids: Brazos, 2016. 210 pp. Several years ago I had the opportunity to take a mission trip to rural Haiti. It was a challenging experience, not least because several of our team members began to experience what I can only describe as spiritual oppression: terrifying dreams, demonic apparitions, a chilling sense of abandonment. Although we felt ill equipped for such manifestations, it led our team to increased spiritual sensitivity and continual prayer, and we returned home with a renewed conviction of God’s power, presence, and activity in the world. What precisely we encountered in Haiti, however, is not as interesting to me as the experience I had upon returning home. I was surprised to find that almost every time I closed my eyes, I spontaneously began to pray. Somehow during the previous week, the impulse to pray had become a matter of muscle memory, the instinctive next action after closing my eyelids. It only lasted a day or so, but it caused me to reflect on the experience and to wonder if I could reproduce it. Could I cultivate an abiding and instinctive posture of prayer, not just in the heightened atmosphere of a mission trip, but in everyday life? Was it possible to train my unconscious habits in rhythms of obedience? 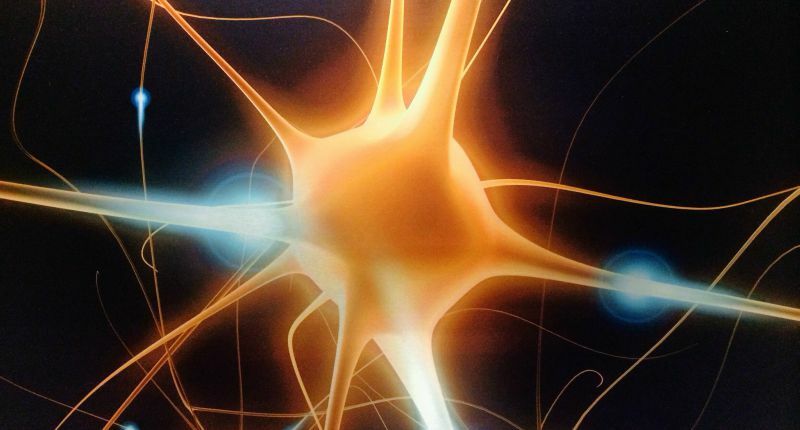 Could faithfulness become a matter of imaginative instinct, and not just intentional action? About a year later, someone suggested I read two books that would illuminate my experience: James K.A. Smith’s Desiring the Kingdom (2009) and its sequel, Imagining the Kingdom (2013). Both have deeply shaped my understanding of Christian formation. Nevertheless, I’ve been hesitant to recommend Smith’s work to friends and former students, worried they might be intimidated by the dense footnotes and dives into phenomenology. Thus I was thrilled when I heard that Smith would be condensing his project in a more accessible version: You Are What You Love. humans are fundamentally defined by what they love, and thus discipleship is fundamentally a matter of re-training our desires through thick Christian practices, especially the practice of Christian worship. What is important here is that, for Smith, practices—not beliefs—for Smith, … practices are the primary currency of discipleship are the primary currency of discipleship. Habitual practices orient our imaginations, inscribing a vision of flourishing on our hearts and pulling us towards the virtues implicit in the vision. To follow the logic of the book: we are defined by desires that are oriented towards particular visions of fullness (chapter 1). We therefore must first expose the ways that our imaginations have been captured by rival visions implicit in cultural practices (chapter 2), and we must then engage in counter-formation through Christian liturgical practice (chapter 3) that will root us deeply in the Christian story (chapter 4). Smith’s new contribution in this volume is extending his argument in terms of what it means for family (chapter 5), education (chapter 6), and vocation (chapter 7). 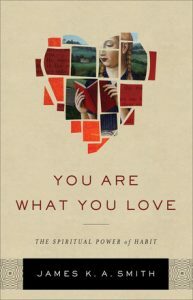 Smith’s central claim that “you are what you love,” may seem uncontroversial. Of course Scripture shows us that the heart is central (Prov. 4:23 et al.). But closer examination of our discipleship practices reveals misplaced priorities, as if following Jesus were mostly a matter of acquiring the right information. For instance, our current practice is to teach people the importance of knowing the Bible, of knowing what they believe, and of knowing their identity in Christ. If we can teach people to think biblically, the logic goes, they will begin to live virtuously. All of this is good so far as it goes, Smith wants to say, but it seems to assume that humanity is directed towards some vision of the good lifepeople are primarily “thinking things” or “brains on a stick” (3). By contrast, Smith argues that Augustine was right: God made us for himself, and our hearts are restless till we rest in him. Thus our humanity is inescapably teleological, directed towards “some vision of the good life, some picture of what we think counts as ‘flourishing’” (11). This vision captures our imagination and roots itself in our desires, which “point us in the direction of a kingdom and propel us toward it” (12). Thus discipleship cannot simply focus on dispensing sound doctrine. It must deal with reforming our imaginations and desires after the pattern of habits that are healthy and holy. The first step of reformation is a diagnosis our current direction. This is easier said than done, for as Smith titles his second chapter: “you might not love what you think.” Citing neuropsychological research that shows that “only about 5% of what we do in a given day is the outcome of conscious, deliberate choices we make,” Smith argues that the other 95% of the time our “adaptive unconscious” is being trained and this training is not neutral (34-35). Insofar as there is a vision of fullness implicit in each practice, everyday practices may become “we unconsciously learn to love rival kingdoms”“secular liturgies” that disorder our loves: “we unconsciously learn to love rival kingdoms because we don’t realize we’re participating in rival liturgies” (37). On this reading, a trip to the shopping mall is formative participation in stories our culture tells us, such as “I’m broken therefore I shop” and “I shop therefore I am” (47-51). Both profoundly deform our discipleship. The remedy for such deformation is the counter-formation of our desires through Christian worship, but not just any form of worship will do (chapters 3-4). Just as the first part of Smith’s argument is fixated on the intellectualism that dominates our discipleship, the second part of his argument is preoccupied with the expressivism that warps our worship. If worship is about me expressing myself to God, then the drive for authenticity of expression in worship will breed a “penchant for novelty” in order to keep things fresh (75). But instead of focusing on how we are doing, Smith avers, we should focus on what God is doing, and see worship not as a site of expression but of formation. And since worship is about formation, form matters. Smith argues that robust worship re-narrates the worshipper into the Christian story with four movements: gathering, listening, communing, and sending. If this story is not present, Smith writes, and renewal is unlikely, then it may be necessary to find a new place to worship. After all: “Your heart is at stake” (100). In chapters five through seven, Smith applies this vision of discipleship in the home, education, and vocation. “You might have Bible verses on the wall in every room of the house and yet the unspoken rituals reinforce self-centeredness rather than sacrifice”I found chapter five to be particularly helpful. Smith both exposes the American mythologies of weddings, marriage, and family and proposes ways “to curate a household as a formative space.” As a husband and parent of two, I found his challenge incisive: “You might have Bible verses on the wall in every room of the house and yet the unspoken rituals reinforce self-centeredness rather than sacrifice” (127). And yet it is precisely at this point that I wonder if worship “works” as straightforwardly as Smith would have us believe. I recall George Lindbeck’s three categories for understanding theology, which place priority alternatively on ideas, experiences, or practices (like Lindbeck, Smith favors the latter). And yet in trying to rectify imbalances caused by “thinking thing-ism” (ideas) and expressivism (experience), Smith runs the risk of overselling the automaticity of our practices. Surely the theological categories that we bring to worship matter, since they inform how we interpret the rituals of worship. And surely our emotional experience of ritual matters: it helps seal the significance of the ritual. Both of these aspects deeply influence the way we appropriate ritual practices; all three mutually inform the way that the imaginative vision implicit in the ritual is inscribed on our hearts. Here Smith’s work invites deeper engagement with the discipline of liturgical theology. Paul Bradshaw, for example, shows how liturgical theologians often miss the complexity of meaning in ritual action. Any given ritual has both official meanings (what it means to the experts) as well as private and normative meanings (particular to each worshipper, concerned with how the ritual integrates with ordinary life), and it is often the latter that are most significant. Liturgies—whether Christian or secular—are complex practices, pushing us in many directions at the same time. Furthermore, they are human practices, and by privileging the official meaning (what the liturgy is doing to us), we miss the possibility that human agents may appropriate either secular or sacred liturgies in ways that do not correspond to official intent. This leads me to greater optimism than Smith concerning the value of cultural practices (consistently deformative for Smith) and greater skepticism concerning the automaticity of even the most robust worship liturgy (the Book of Common Prayer is no panacea for deformed discipleship). In any case, as I read You Are What You Love, I was provoked to audit my own life and reconsider: what does it look like to raise children, to run a youth ministry, and to pursue vocational faithfulness if it is not the intellect but the imagination that is central in forming our hearts? We need wise leaders who model and train Christians in cultural agency: the ability to renew the cultural practices we encounter, to make our ordinary rituals more beautiful, more just, and more resonant with in the gospel of Jesus Christ. Justin A. Bailey (MA '13) is a PhD candidate and adjunct professor at Fuller Seminary. 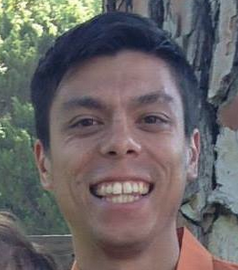 He serves as pastoral assistant for teaching and discipleship at Grace Pasadena. Together with his wife and two children, he lives at Madison Square, an experiment in intentional Christian community.